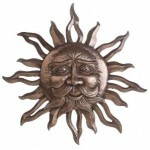 Belenos, the Celtic Sun God as a lovely plaque. Among the Gauls and certain British Celts, the name of the God of Solar Fire and purification was Belenos. Often incorrectly labeled as a "Gorgon's head" or a "male medusa", this mask comes to us as a bas-relief from the Roman Baths at Aqua Sulis in Bath, England. This lovely cast resin plaque is antique white stone finish and 6 inches in diameter. Item Number: MT-BELENOS | Approximate Size (Inches): 0.50 wide x 6.00 deep x 6.00 high | Approximate Shipping Weight: 2.00 lbs.